Automatic License Plate Recognition (ALPR) is an important task with many applications in Intelligent Transportation and Surveillance systems. As in other computer vision tasks, Deep Learning (DL) methods have been recently applied in the context of ALPR, focusing on country-specific plates, such as American or European, Chinese, Indian and Korean. However, either they are not a complete DL-ALPR pipeline, or they are commercial and utilize private datasets and lack detailed information. In this work, we proposed an end-to-end DL-ALPR system for Brazilian license plates based on state-of-the-art Convolutional Neural Network architectures. 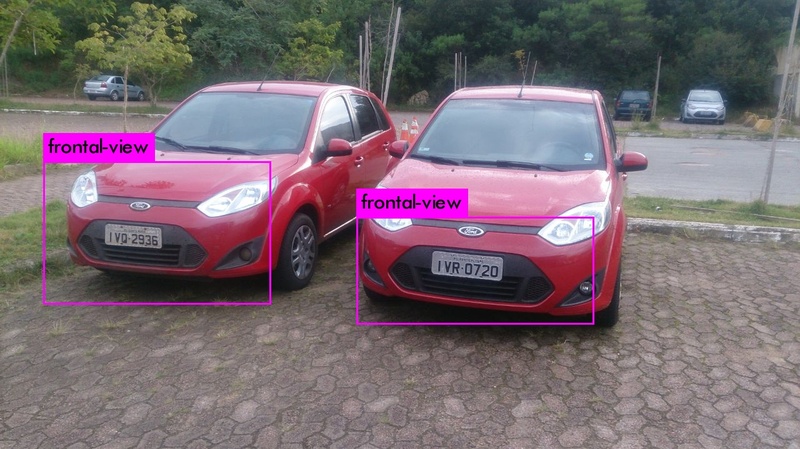 Using a publicly available dataset with Brazilian plates, the system was able to correctly detect and recognize all seven characters of a license plate in 63.18% of the test set, and 97.39% when considering at least five correct characters (partial match). Considering the segmentation and recognition of each character individually, we are able to segment 99% of the characters, and correctly recognize 93% of them. For the following commands, I assume that you have the Darknet framework correctly compiled. Remember that we achieved real-time using a high-end GPU (NVIDIA Titan X). ./darknet detector test fvlpd.data fvlpd-net.cfg fvlpd-net.weights -thresh .4 <<< "sample_image.jpg"
As a result, you should see an image like the one below. ./darknet detector test fvlpd.data fvlpd-net.cfg fvlpd-net.weights -thresh .2 <<< "frontal_view_car2.jpg"
./darknet detector test lpscr.data lpscr-net.cfg lpscr-net.weights -thresh .6 <<< "lp_car2_gray.jpg"
Whoah! Characters segmented and recognized! In this particular case, the "I" was misclassified as "1". In order to correct some misclassifications, we perform a final heuristic post-processing to exchange numbers by letters and vice versa. Actually, this (heuristic) is specific for Brazilian license plates, whose layout consists of 3 letters followed by 4 digits. Details are given in the paper.